The discovery of three closely orbiting supermassive black holes in a galaxy more than four billion light years away could help astronomers in the search for gravitational waves: the 'ripples in spacetime' predicted by Einstein. An international team, including Oxford University scientists, led by Dr Roger Deane from the University of Cape Town, examined six systems thought to contain two supermassive black holes. 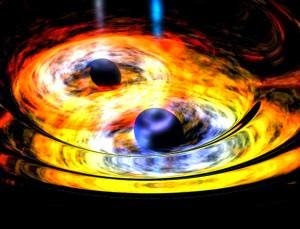 The team found that one of these contained three supermassive black holes – the tightest trio of black holes detected at such a large distance – with two of them orbiting each other rather like binary stars. The finding suggests that these closely-packed supermassive black holes are far more common than previously thought. The team used a technique called Very Long Baseline Interferometry (VLBI) to discover the inner two black holes of the triple system. This technique combines the signals from large radio antennas separated by up to 10,000 kilometres to see detail 50 times finer than that possible with the Hubble Space Telescope. The discovery was made with the European VLBI Network, an array of European, Chinese, Russian and South African antennas, as well as the 305 metre Arecibo Observatory in Puerto Rico. Future radio telescopes such as the SKA will be able to measure the gravitational waves from such black hole systems as their orbits decrease. While the VLBI technique was essential to discover the inner two black, the team has also shown that the binary black hole presence can be revealed by much larger scale features. The orbital motion of the black hole is imprinted onto its large jets, twisting them into a helical or corkscrew-like shape. So even though black holes may be so close together that our telescopes can't tell them apart, their twisted jets may provide easy-to-find pointers to them, much like using a flare to mark your location at sea. This may provide sensitive future telescopes like MeerKAT and the SKA a way to find binary black holes with much greater efficiency.